Modern technology cannot do without polymers and. The range of their applications is extremely wide. Plastics are widely used in construction, engineering, agriculture and many other fields. But the biggest part of the used polymeric materials (about 40%) goes with the package. Such plastic properties caused their widespread usage, both in food and non-food packaging. However, due to the outstanding properties of polymers follows one serious drawback. The fact that the plastic packaging after its use for hundreds of years does not decompose. This means that all the plastic bags, which have not been reprocessed, produced by the human for all time still exist! A long time the problem was not given due attention, and polymer packaging was simply thrown. The alarm sounded a few years ago when the plastic pollution has become a global environmental catastrophe. But biodegradable garbage bags can help. Confirmation of the seriousness of the problem may be the streets of big cities and ponds, especially in third world countries, and most of all – a huge garbage island, a continent of floating plastic in the heart of the Pacific Ocean. The use of biodegradable polymers. The wide introduction, where it is possible, of the biodegradable polymer packaging and biodegradable garbage bags will also help to clean up the planet from plastic. Basically, there are 2 types of biodegradable polymers. Biopolymers from vegetable raw materials – are generally based on polylactic acid or a farina. This type of polymers has a rather limited application due to low physical-chemical properties. Also in the process of biodegradation is producing gas of methane, which by itself influence badly on the environment. Polymers, which were modified by Oxo-biodegradable additives. These conventional polymers, which include a special catalyst, a hundred times accelerate their natural decomposition. 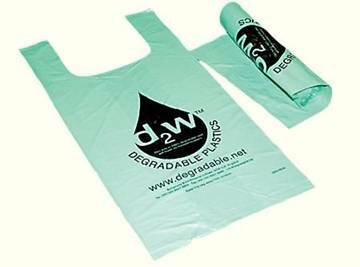 This is our way to make biodegradable garbage bags.